Zillow.com reports Palm Desert to be a "Hot" market with the median home value at $350,600 in early 2019. There are many condos and townhouse developments, Sun City Palm Desert, a community of close to 5,000 homes for 55+ is located here along with several other communities. See link on upper left. Palm Desert offers a lot of outdoor recreation with many golf courses, hiking and biking trails, parks and an aquatic center. It also has a performing arts center, shops, restaurants, art galleries, and sunny skies almost everyday. High cost of living, and summers are very hot, with temperatures reaching over 100 degrees. Palm Desert boasts over 350 days of sunshine each year with average January temperature at 58 degrees and July's average is 96 degrees. Summer temperatures can easily go over 100 degrees. 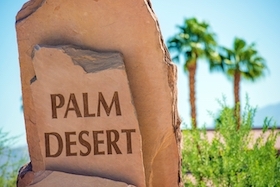 Palm Desert boasts upscale shopping on El Paseo Drive, a mile long strip of over 250 shops, dining and the arts. 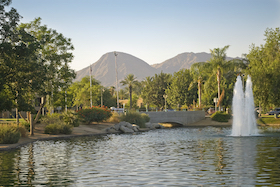 Palm Desert also is home to the McCallum Theatre, a state-of-the-art performing arts center, an art museum, several parks, an aquatic center, amphitheater, and The Living Desert Zoo and Gardens. Palm Desert's crime rate is a little lower than the national average. Eisenhower Medical Center provides primary care services here, its hospital is in nearby Rancho Mirage. Sunline Transit provides transportation in the Coachella Valley; Palm Springs International Airport is just 13 miles away.